Chicago Author. Journalist. Editor. Writer. Script Doctor. Consultant. Chicago, Illinois. Democrat Pat Quinn made his name in Illinois through political activism, and those familiar with the office say he’ll need to keep that approach to get things done when he becomes lieutenant governor in January. In other words, it’s an office defined by whoever holds it. In Kustra’s case, the agenda included economic development, conservation and higher education. Current Lt. Gov. Corrine Wood has focused on women’s health and the Main Street program for job development. “There’s a lot of room for someone who has an interest in an issue to go out and carve their own niche,” said Charles Wheeler, an associate professor of legislative studies at the University of Illinois-Springfield. Quinn, 53, said he plans to focus on consumer advocacy issues and will use his experience as a former state treasurer to help Gov.-elect Rod Blagojevich with balancing the state budget. The track records of recent lieutenant governors contrast with the image of the office created when Dave O’Neal, Republican Jim Thompson’s lieutenant governor, resigned in 1981 because he said he didn’t have enough to do. “For anyone who says there’s no clout in the lieutenant governor’s office, that’s just because they haven’t tried,” Kustra said. One quirk of the office is when a lieutenant governor resigns – as in O’Neal’s case or when Kustra left office in July 1998 to become president of Eastern Kentucky University – the constitution mandates the office cannot be filled until the next election. The office is also unusual on a nationwide level. The lieutenant governor presides over the state senate in about half the states, a practice Illinois stopped in 1970. Eight states don’t even have lieutenant governors. Another 21 elect theirs independently of the governor – which Illinois did until the state rewrote its constitution in 1970. Voters chose a split ticket in 1968, electing Republican Gov. Richard Ogilvie and Democratic Lt. Gov. Paul Simon, and the new constitution requires candidates to run separately in the primary and together in the November election. That hasn’t stopped many candidates from endorsing a running mate in the primary. Kustra and Wood were handpicked by Edgar and George Ryan, respectively. In her campaign for the gubernatorial nomination in last March’s Republican primary, Wood recommended State Rep. William O’Connor (R-Berwyn). Instead, Attorney General Jim Ryan and his chosen sidekick, State Sen. Carl Hawkinson (R-Galesburg) took the nominations. That was true in this year’s election cycle. The Democratic gubernatorial primary featured a slim victory by U.S. Congressman Blagojevich (D-Chicago) against former state Attorney General Roland Burris and former Chicago Public Schools chief Paul Vallas. None of the candidates endorsed a running mate. Meanwhile, Quinn handily defeated Joyce Washington and Mike Kelleher for the lieutenant governor slot. Both Wood and Kustra experienced the unusual situation of running unopposed in their lieutenant governor primary, while their running mates faced opposition. Kustra said that despite the challenge by conservative activist Steve Baer, he and then-Secretary of State Edgar never considered the possibility of a split primary decision. Still, split tickets have happened before. When Dan Walker won the Democratic gubernatorial primary against Simon in 1972, he found himself paired with Neil Hartigan, Simon’s chosen running mate. In 1986, Sen. Adlai Stevenson III vacated the Democratic nomination when Mark Fairchild, a supporter of ultra-conservative Lyndon LaRouche, took the lieutenant governor primary. Stevenson instead ran unsuccessfully as the Solidarity Party candidate and lost by a wide margin to the incumbent Thompson. Barring such circumstances, lieutenant governor candidates spend much of the election cycle traveling the state and filling in the gaps in the governor’s schedule. Kustra said he had originally planned to leave the office at the end of his first term, after beginning serious negotiations with Chicago’s WLS-AM to host a radio talk show. But when Edgar underwent a quadruple bypass in the summer of 1994, he came back on the ticket. 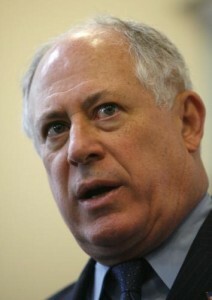 Quinn said he and Blagojevich split their time to cover as much of the state as possible before the Nov. 5 election. In addition to covering more geographic ground, the lieutenant governor can help shore up a running mate’s voter base. Don Haider, a professor of public management at Northwestern University, said Wood “certainly helped” Ryan’s campaign among female voters in 1998, and that Quinn also had his own constituency. In addition to his term as state treasurer from 1991-1995 and a term on the Cook County Board of Tax Appeals, Quinn worked for years as a consumer advocate and led numerous statewide petition drives. The first major drive, in 1976, collected a state-record 635,158 signatures and ended the practice of legislators receiving their full year’s pay on their first day in office. Subsequent Quinn-sponsored petitions led to the creation of the consumer-protection Citizens Utility Board in 1983 and included the only constitutional amendment ever passed by referendum in Illinois. The 1980 Cutback Amendment reduced the size of the General Assembly by one third – two years after Quinn led a campaign in which 40,000 voters mailed tea bags to their legislators to protest a planned pay hike. Kustra said Quinn’s activist history should help in office, but cautioned him to make sure the governor shares his positions. Kustra gave the example of a speech in which he began talking about individual governing boards for state universities before Edgar had committed to the plan. “I said ‘Jim, I’m really sorry. I think I got out in front of you,'” Kustra said. “Luckily, it just so happened he thought that was a great idea anyway. Quinn said he and Blagojevich have worked closely since the election, and that the governor-elect keeps him involved with the various transition teams. “Pat Quinn is playing a very big role in this budget process because he brings not only his experience as state treasurer to the job, but he also brings the necessary understanding of reform,” Blagojevich said, “and a career that’s been dedicated to changing the way business is done. Return to the home page for more about Chicago journalist Jeff Fleischer.